Prepare your site plan using information supplied by the owner and/or satellite images. Prepare building plans, computations and Certificate of Compliance for the building surveyor. Check for other permits that may also be required e.g. Town Planning, Build Over Easement permissions from the relevant statutory authorities, Council Report & Consent. Submit the application to the building surveyor and pay his fee, council lodgements fees and the State Government Levy and HIH Building levy. Communicate with the owner throughout as required and at the key progress points. Send the owner the original approved stamped building permits and supporting documents and take a copy for our files. The Registered Builder will visit the site and check the agreement details. The Registered Builder will prepare a Major Domestic Building Contract. If the project is in excess of $12,000, the Registered Builder will obtain Domestic Building Insurance for the project. A fee for this service will be quoted separately and noted as the Registered Builders Service. We are an independent manufacturer and installer of prefabricated buildings, not just an agency or franchise outlet. Cut out the middle men! We only use the best in order to give you the best! 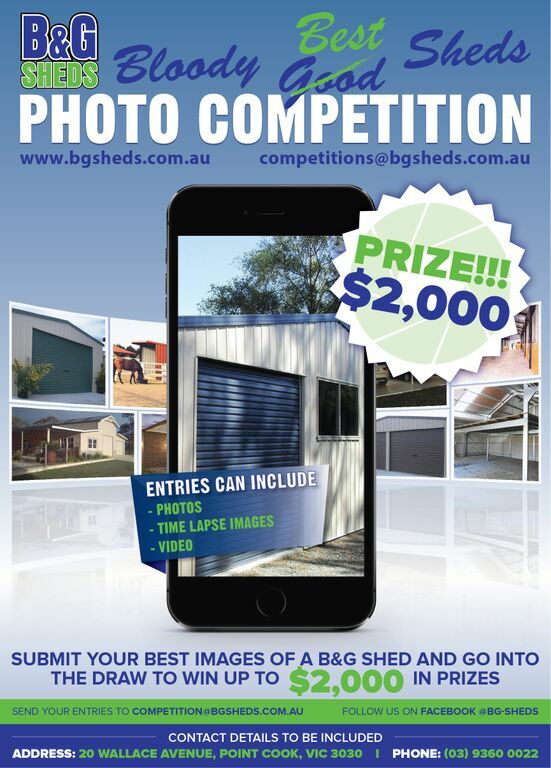 That means 100% Australian made Bluescope, Zincalume and Colorbond Steel.” Dennis Kerr, Director of B&G Sheds. Copyright © 2015 B & G Sheds. Web design Melbourne.